Sharad Pawar's reign as the president of the International Cricket Council ended on Thursday as New Zealander Alan Isaac took charge from him for a two-year term at the ICC Annual Conference in Kuala Lumpur. Issac will be the last to hold the post in its current shape as it will become a ceremonial role once he steps down in 2014. Over the past two years, Isaac has been the ICC's vice-president, a position that the body plans to abolish by amending the constitution. The amendment envisages the appointment of a chairman, who will hold office for two years, as the head of the ICC. "When I look at the list of previous presidents, I am reminded of the importance of this office. In the midst of my pride at being chosen as president, I recognise that there is, of course, much hard work and much progress needed if we are to maintain the game's current healthy state," Isaac said. "I believe that the challenges ahead are no less daunting than those we have faced in the last two years if we are to maintain the vibrancy and viability of the three formats of the sport. We are fortunate as a sport -- indeed unique  to have three different formats at international level. "We will all strive not only to preserve those formats but to build on their foundations. 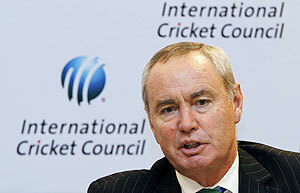 In that way the ICC will continue to oversee a great sport and we will all work to make it even greater. I look forward to serving the game with honesty and integrity and to the best of my ability. I look forward to handing on the guardianship of the sport with the game enjoying even greater health," he said. Richardson, after being confirmed as successor to Lorgat who stood down after four years as the ICC Chief Executive, said, "It is a real honour to be confirmed as the ICC Chief Executive and I want to pay tribute to Lorgat. "I have learnt much in the last four years and I inherit a game in great health with much to be optimistic about. I look forward to building on that and tackling the challenges ahead," Richardson, who played 42 Tests for South Africa and has been ICC's General Manager - Cricket for the last 10 years, said. Meanwhile, it was decided that necessary amendments to the ICC and IDI Articles of Association would be made to create the post of chairman, remove the role of Vice-President and vary the role and powers of the President, all with effect from the close of the 2014 Annual Conference. The formalisation of these amendments will give effect to the principles agreed by the ICC Board earlier this year. Until the end of the 2014 Annual Conference, the role of the ICC President will remain in its current form, but from the end of the 2014 Annual Conference it will become ceremonial in nature with a term of only one year. A new role of chairman of the ICC and IDI Board will be created from the end of the 2014 Annual Conference. The term of office will be two years and the chairman will be appointed by the Board at its first meeting following the 2014 Annual Conference. Russia and Hungary were confirmed as new Affiliate members of the ICC but Switzerland was removed as an Affiliate member having been suspended at the 2011 Annual Conference for failing to comply with the ICC's membership criteria and remaining unable to do so by the 2012 Annual Conference. There are now 106 Members of the ICC. The ICC Annual Conference is made up of representatives of the 10 full members, 36 associate members and five affiliate regional representatives.